When dementia enters an elderly couple’s home, it can bring financial mismanagement with it. But since both spouses don’t usually become cognitively impaired at precisely the same time, couples have the option of turning over the household financial responsibilities to the person who’s not yet impaired. The question is whether this transfer of control happens quickly enough. Most couples are waiting until after cognition is very low to make this change, according to a new study. 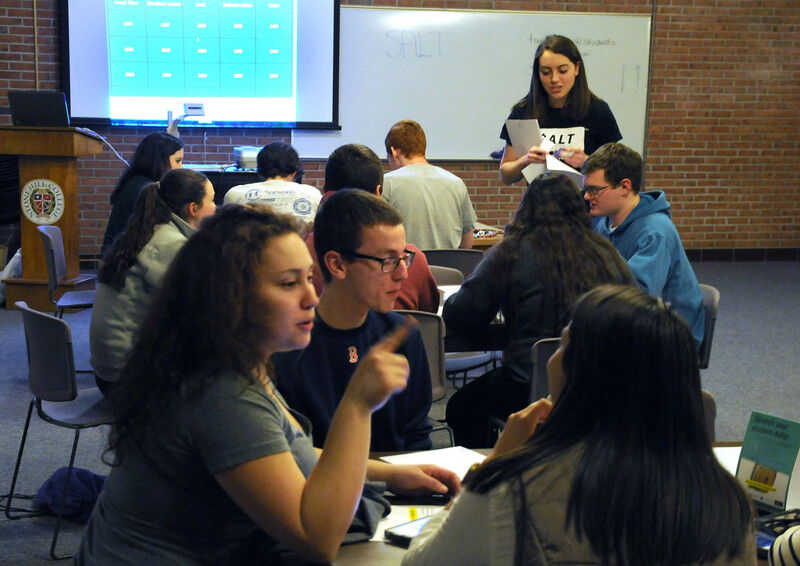 Tatiana Andrade (standing), an ambassador for American Student Assistance, hosts a Jeopardy match to educate classmates about their student debt. College students usually plan on repaying their loans after graduation, when they’ve landed a full-time job. Freshman Tatiana Andrade is making payments while she’s still in school. Andrade is already $14,500 in debt. She’s on track to owe some $60,000 when she completes her four-year degree at Stonehill College outside Boston, even though her parents are sharing the cost. To chip away at her debt, she pays off between $100 and $150 per month from her earnings in a part-time job. Andrade is among a slim but growing minority of students and recent graduates becoming proactive to get control of their student debt – before it controls them. She advises classmates to do the same as Stonehill College’s ambassador for the non-profit American Student Assistance (ASA), which has a program and website – SALT – aimed at educating and counseling students on strategies to minimize how much they borrow and to manage their loan payments. Making loan payments today minimizes the total amount she’ll pay in the future for three reasons. Loans paid immediately carry a lower interest rate than loans that permit her to defer payment until after graduation. She’s cutting down the total amount she’ll have to pay back after graduation. She said she also avoided a loan-origination fee required on deferred loans equal to 4 percent of the loan. The IRS effectively gives money away to low-income Americans who save for retirement. Workers meeting the agency’s income requirements can receive a Saver’s Tax Credit equal to as much as half of their total deposits into a 401(k) or IRA. The lower one’s income, the bigger the credit. Low-income workers do just that, a previous study found: 40 percent decline to participate when their employer offers a 401(k). But the Savers Tax Credit may provide another avenue to this under-covered population. *Note: Credits are equal to 10 percent, 20 percent, or 50 percent of total contribution. Vanguard Group Inc. founder John Bogle’s views about investing, not surprisingly, promote the indexed mutual funds that Vanguard offers. But his views have solid support in the academic literature. Remember reversion to the mean. If a company’s stock or the overall market has had unusually strong performance, it’s unlikely to continue at that pace. More than 60 percent of Americans who participate in their 401(k) retirement plans at work are adding more dollars to their debts than they’re socking away in those plans, according to HelloWallet’s analysis of recent federal data. This shocking statistic suggests the need for some serious financial planning. Yet the vast majority of people in a recent survey said making a financial plan would not be among their 2014 resolutions. Why not? Many said they “don’t make enough money to worry about” a financial plan, according to Allianz Life Insurance Company, which conducts the survey. Money matters can get complicated for couples who may not see eye to eye. 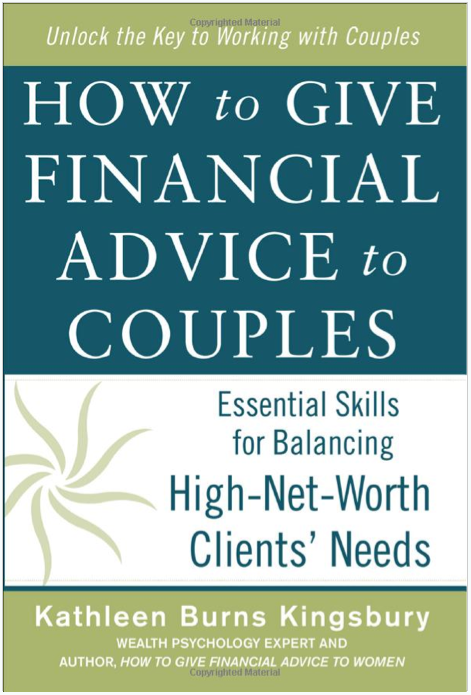 In a recent interview with Squared Away, Kathleen Burns Kingsbury, author of the new book, “How to Give Financial Advice to Couples,” shared her tips and insights for couples trying to meet in the middle. Q: In a relationship, is money about more than just money? Kingsbury: Money is often a reflection of our feelings about security, respect, love, power – it really symbolizes these things, whether we’re aware of it or not. So how a couple talks about money and manages their money is a reflection of how they relate to each other in other areas as well. Kingsbury: A money belief is a thought or attitude toward money that influences your savings, spending, investing and gifting every day. These beliefs tend to reside in our unconscious thought. Because we live in a society where money talk is taboo, we often don’t identify these attitudes. But money beliefs are formed between the ages of 5 and 15 by observing the financial behavior and attitudes of parents or people around us. And these money beliefs tend to be oversimplified, because they were formed in a child’s mind. Q: Why is it important for husbands and wives to compare their beliefs? Kingsbury: When couples are arguing about money, they may be arguing about which bills to pay or how to pay for a daughter’s college. But what’s really going on is they’re hitting up against their different money beliefs. Too many financial products are far too complex. The pre-loaded cards that people give as gifts during the holidays are a multi-billion-dollar example. When buying these cards, it’s very hard to know what you’re getting and giving. The big things to watch out for are expiration dates and fees. This isn’t easy. The federal CARD Act of 2009 covers cards issued by retailers for purchases in their stores and cards issued by banks for use in many places. The law bars these gift cards from expiring for five years after their purchase. They must also maintain their full value for a year. But after the first year, the CARD Act permits one fee per month, and a $5 monthly fee can chew up a $25 gift card’s value pretty fast. It’s difficult to tell the difference between gift cards and prepaid cards, like Wal-Mart’s Bluebird or the RushCard, sold side by side on grocery store racks. But prepaid cards are not regulated at all by federal consumer protection law, while retail and bank cards are, said Christina Tetreault, an attorney for Consumers Union, the non-profit affiliated with Consumer Reports. State regulations often offer further consumer protections – and add a layer of complexity for consumers. A card that works one way in a state with strong regulations, such as California, may have few protections if you mail it to a relative in Texas.